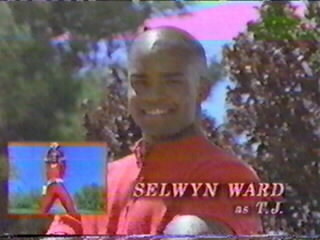 T.J. is arguably the backbone of the Power Rangers team. He is courageous, dedicated, determined, intelligent, and charismatic. Never hesitating to put himself between a friend and harm, T.J.'s loyalty to his friends takes precedence over his own life to him. T.J. possesses remarkable leadership abilities and was the leader of the Power Rangers Turbo and now the second in command of the Power Rangers In Space. T.J. moved to Angel Grove on his father's recommendation to hone his baseball skills. Jake 'Orel' Rosetti, an old friend of T.J.'s father suggested that T.J. join the Angel Grove High School baseball team to build his skills. On his way to Angel Grove he befriended his soon to be teammate Cassie and with her help he was able to rescue Kat and Tommy from Divatox's Piranhatrons. T.J's bravery and strength caught Tommy's eye who decided to leave the role of the Red Turbo Ranger as well as leadership of the Power Rangers Turbo in T.J.'s capable hands. When Divatox destroyed the Power Chamber and the Turbo powers, T.J. along with his fellow Rangers blasted off for outer space in a N.A.S.A.D.A. Space Shuttle to try and rescue Zordon. 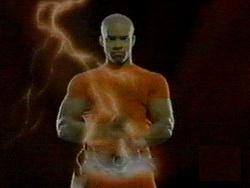 Along the way they encountered Andros who granted T.J. new powers making him the Blue Lightstar Ranger. 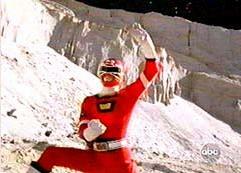 As the Red Turbo Ranger T.J. piloted the Red Lightning Turbo Zord and the Lightning Fire Tamer Rescue Zord. T.J. also piloted the sentient car known as the Lightning Cruiser.